Star Vaughan enjoys a midmorning mud spa. Madison Basler receives a helping hand from mom Katie Basler. Nicole Kramer takes a muddy plunge on the rope swing obstacle. 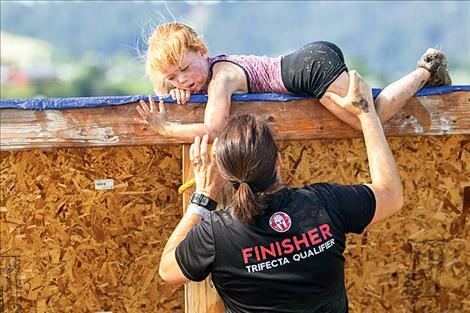 POLSON – What better way to start the weekend than a grueling obstacle challenge and a roll in the mud? That was the plan for many mud runners who sloshed their way through the 5th Annual Polson Mud Run on Saturday morning at the Polson Fairgrounds. 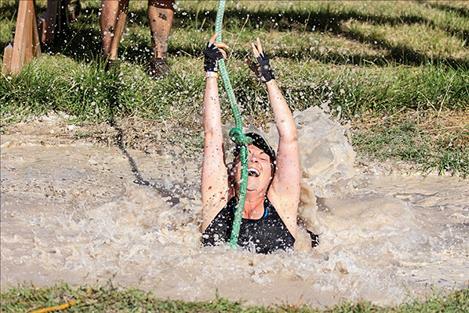 The Mud Run has become a popular summer time ritual, between 100 to 200 local and out-of-town participants are challenged by the muddy and exhausting 5K obstacle course each year. Among them is Nicole and Derrick Kramer, visitors from New Jersey, who attend every year. The event is designed for runners of all levels and abilities, from serious athletes to parents who want to experience something new with their kids. The course includes plenty of water and mud to get covered in along with plenty of obstacles to climb over and go under. 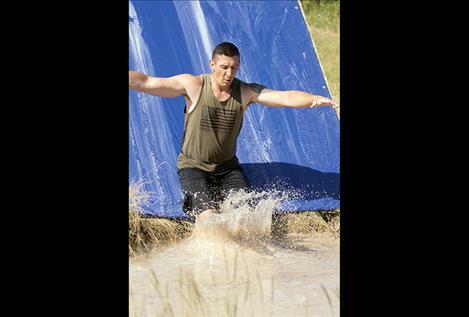 Challenges showcased were a rope swing across a mud pit, an “Army crawl” through a muddy water hole, a hay bale climb and a crawl through a corrugated plastic tunnel seesaw. Getting out for some fresh air and exercise is another draw for runners. “My sister made me get up and do this,” said Amber Dailey. Proceeds from the event help benefit the Boys and Girls Club of the Flathead Reservation and Lake County, which provides after-school programs and summer camps for elementary school and middle school aged kids in the Mission Valley. For more information about the Flathead Boys and Girls Club call 406- 676-5437, 406-883-5623 or go to www.flatheadbgc.org.